Every dog deserves to be in a loving and devoted home. But many wait way too long, even years, for their forever home. The pets that reside in shelters are not inferior or defective; in fact they have a lot to offer their human counterparts with regard to love, companionship, and affection. Here are some reasons to take the time to check out your local animal shelter and get to know the residents. Who knows, one of them may find their way into your heart! 1. You may find the “pet of your dreams”: Shelters offer a wide variety of dogs, of every age, and in every breed imaginable. Pure-bred dogs are not immune from ending up in shelters, and neither are puppies or older dogs that once had a place to call home. 2. You can help lessen the pet overpopulation: The overpopulation of animals can be linked to a couple factors, the most prevalent ones being supply and demand, and the failure to get pets spayed and neutered. Dogs and puppies from puppy barns or pet stores that are not sold usually end up in shelters, if they are lucky. Others are sent to lab testing facilities or discarded as trash. For many of these retail outlets, puppies and dogs are a commodity no different than a jacket or a pair of shoes. 3. Shelter pets are less expensive: Shelters offer adoptions for less than you could purchase a dog from a dog barn or pet store. Shelters also offer access to resources such as training, low-cost spaying and neutering, and vaccinations. 4. You can skip the puppy stage: Older pets tend to be calmer and already house-broken. What you see is what you get, and the puppy-hood tendencies of tearing up the house have usually been outgrown. Mind you, many dogs take several days to adjust to their new surroundings, so be patient as an accident here or there is bound to happen. 5. 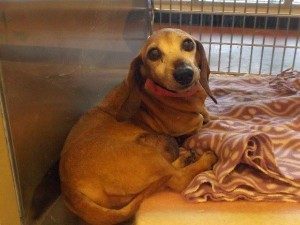 You might save an older, and oftentimes overlooked, pet from spending years waiting to be adopted. It is a nice thought that the last years of an ole’ dog’s life will be spent surrounded by love and care. 6. You will help to keep the shelter operating: By adopting from a shelter, you help with operating costs, and make room for another pet in need. 7. You will receive the priceless gift of LOVE and LOYALTY: Above all, the dog that you adopt from a shelter will love you unconditionally and show you great loyalty. These are the greatest honors a dog can bestow on their human companion. Shelter animals wait every day for someone to come and adopt them. Help them live a life full of love and friendship. 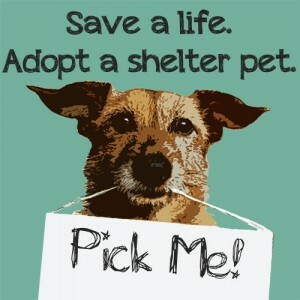 Consider adopting a shelter dog today!